We’d love your help. 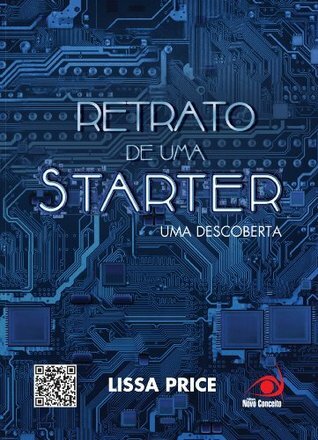 Let us know what’s wrong with this preview of Retrato de uma Starter by Lissa Price. Veja como tudo começa para Callie e Michal no mundo de Starters. Veja como tudo começa para Callie e Michal no mundo de Starters; este conto foi disponibilizado após o lançamento do livro Starters e é contado a partir da visão de Michael. Uma história complementar que vai te ajudar a entender mais o mundo de Starters. Um conto intermediário; lança Veja como tudo começa para Callie e Michal no mundo de Starters. Um conto intermediário; lançado depois de Starters que antecede o lançamento de Enders e conta a história com uma visão diferente da heroína principal. To ask other readers questions about Retrato de uma Starter, please sign up. is there a version of this where all the starter stories have been combined into one paperback? Una historia corta desde la perspectiva de Michael. Que es un personaje que no tuvo tanta participación en la historia y del cual no conozco demasiado, pero que me ha sorprendido con su punto de vista. Tengo ganas de saber más de él en Enders, de eso no hay duda. Bueno, ahora sabemos el por qué de la portada de Starters. Me encanta Michael, no sé por qué pero siento que este chico nos va a sorprender en Enders. Michael is a starter, and an artist. In a world ravaged by the Spore Wars, Michael lost his parents. Only the young and old remain. Most of the young appear to have nothing, and are unable to work but the old appear to be well off. Only a select few young who have been claimed by distant relatives seem to be well off. Michael lives with his friend Callie and her younger brother Tyler. When Callie asks Michael to watch her sick brother for the day, but wont tell him what she is up to he is worrie Michael is a starter, and an artist. In a world ravaged by the Spore Wars, Michael lost his parents. Only the young and old remain. Most of the young appear to have nothing, and are unable to work but the old appear to be well off. Only a select few young who have been claimed by distant relatives seem to be well off. Michael lives with his friend Callie and her younger brother Tyler. When Callie asks Michael to watch her sick brother for the day, but wont tell him what she is up to he is worried. Michael follows her and what he finds is a company called Prime Destinations. But what is Prime Destinations all about and why did Callie go there? It was that short that I don't have almost any opinion about it. Me gusto mucho esta ¿mini novela? Yo lo tomaria como un capitulo desde el punto de vista de Michael. Ahora mas que nunca necesito leer Enders. Como historia corta es realmente buena pues vemos el inicio del primer libro y no solo eso, sino desde el punto de vista de Mishael, el amigo de Callie. Además de que entiendes el por qué de la portada de Starters. Ves aquí los sentimientos de protección, cariño y amor de Mishael a Callie. Diese kurze Geschichte erweist sich als kurze, parallel laufende Geschichte zum Anfang des Romans "Enders", allerdings eine die man nicht zwingend lesen muss. Der Starter Michael ist leidenschaftlicher Zeichner und bringt immer mal wieder das ein oder andere Porträt zu Papier. Aus seiner Sicht wird diese Geschichte auch geschildert. Sein Lieblingsmodell ist allerdings Callie, die Hauptperson aus dem Roman „Starters“ – nicht, dass sie wüsste, dass er sie zeichnet. Diese kurze Geschichte geht darum Diese kurze Geschichte erweist sich als kurze, parallel laufende Geschichte zum Anfang des Romans "Enders", allerdings eine die man nicht zwingend lesen muss. Der Starter Michael ist leidenschaftlicher Zeichner und bringt immer mal wieder das ein oder andere Porträt zu Papier. Aus seiner Sicht wird diese Geschichte auch geschildert. Sein Lieblingsmodell ist allerdings Callie, die Hauptperson aus dem Roman „Starters“ – nicht, dass sie wüsste, dass er sie zeichnet. Diese kurze Geschichte geht darum einen kleinen Einblick in die Welt der Starter und Ender zu bekommen, außerdem spielen der Anfang des Romans und diese Kurzgeschichte zu genau der Selben Zeit, lediglich unterschiedlichen Sichtweisen, was ich persönlich sehr interessant finde. Da ich den Roman noch nicht gelesen habe, aber die Leseprobe zu eben diesem ist mir gerade der erste Teil gut in Erinnerung geblieben und ich konnte diese Parallele herstellen. Es una historia corta antes del primer libro en donde aparece Callie, quien es la protagonista del primer libro y Michael. El libro esta contado del punto de vista del chico, espero que aparezca mas en el primer libro. No esta nada mal, puede que me agrade esta saga. Portrait of a Starter by Lissa Price is a novella in the Starters series. It is about Callie and Michael before the events of Starters. It is a very good novella because it is told from Michael's point of view. Not much to this novella. I read it after reading Starters. It's told from Michael's point of view and takes place just before the events in Starters. Nothing particularly revealing to make this worth reading. Jump right to the main book and enjoy! Mengambil cerita dari sudut pandang Michael, tetangga sekaligus sahabat Callie yang suka menggambar. Sama seperti Callie dan Tyler, Michael juga tak punya wali. Jadi mereka sama-sama tinggal di jalanan. Callie menitipkan Tyler pada Michael saat Callie mendonorkan tubuhnya di Prime Destination. (Seperti yang juga diceritakan di Starters). Tapi kemudian Michael juga penasaran tentang PD dan mengikuti Callie, ia menitipkan Tyler pada temannya. Apa yang terjadi kemudian cukup mengejutkan. Untu Mengambil cerita dari sudut pandang Michael, tetangga sekaligus sahabat Callie yang suka menggambar. Sama seperti Callie dan Tyler, Michael juga tak punya wali. Jadi mereka sama-sama tinggal di jalanan. Untuk ukuran novella setebal 16 halaman, cerita ini sangat padat dan melengkapi novel regulernya. Alih-alih "mengulang" apa yang diceritakan Callie, novella ini justru memberikan missing piece yang ada di Starters, twisted dan cukup mengharukan. Seperti sudah sebuah tradisi ya, penulis novel berserie di luar sana suka menulis novella singkat yang biasanya hanya dirilis versi ebooknya. Untuk menandai lini masanya biasanya dengan tanda koma. "Será que Cinderela chagara a cogitar a possibilidade de confessar a verdade para o príncipe na noite em que se divertira com o belo vestido no baile? Será que chegara a pensar em dizer que, ah, por falar nisso, Príncipe, a carruagem não é minha, sou apenas uma criada suja e descalça e essa aparência não vai durar muito tempo? Não. Ela tinha aproveitado cada momento. E fora embora discretamente depois da meia-noite." While this was a short read, and I haven't yet read the Starters series, I am very intrigued about it. I will hopefully get to them soon. I would love to know the background and what exactly happened and why things are the way they are. Looking forward to reading them. It's a great tease told from Michael's point of view and takes place just before the events in Starters. Jest to króciutka książka, a właściwie nowelka, która opowiada o losach Michael'a i Callie. Chłopak dowiaduje się tutaj trochę o Prime Destination. Nie jest to wymagająca książka, więc śmiało mogą po nią sięgnąc osoby, które dopiero zaczynają swoją przygodę z czytaniem w języku angielskim. I liked seeing Callie from Michael's point of view. Estoy planeando (al fin) leer Enders muy pronto, así que cualquier cosa que me ayude a recordar lo que pasa en Starters es bien recibida. Si antes quería leer Startes, este pequeño ( seriamente pequeño ) libro me dió más razones. Oh, another crazy, fast-paced, incredibly awesome novella! I love a good dystopian book and this sure looks like one. It’s true that we don’t get to know much about Michael’s world and about what’s really going on between Starters and Enders—or even about what Starters and Enders truly represent—but the little information given through narration was so suspiciously curious that I, personally, can not wait to seriously start reading and discovering this book. Price was clever by presenting this no Oh, another crazy, fast-paced, incredibly awesome novella! I love a good dystopian book and this sure looks like one. It’s true that we don’t get to know much about Michael’s world and about what’s really going on between Starters and Enders—or even about what Starters and Enders truly represent—but the little information given through narration was so suspiciously curious that I, personally, can not wait to seriously start reading and discovering this book. Price was clever by presenting this novella in the perspective of a male character, an important character, especially because the real action in it is endured by Callie, the protagonist, and the girl with whom he seems to share everything. I believe that, this way, we get to understand Michael a little bit more and, by watching his reactions and fears regarding what Callie is secretly doing, we also have the chance to better acknowledge his feelings for her. There’s a tiny hint of a love interest simply due to a certain jealousy he shows towards the person Callie meets with, and an evident despair by what she does without telling him a thing. I really enjoyed how the places and the people were described, as a reader I want to feel like I can visualize everything I’m reading, and that happened for sure. The memory situation left me hanging on, thirsty for answers. The relationships and animosities between Starters and Enders also made me question a lot of things, and seek for more information. Overall, this novella was the perfect entryway to a complete different world that I can’t wait to know more about, and to two characters that seem to have much, much more to show. Thumbs up for this one! Retrato de uma Starter é um conto introdutório ao universo Starter narrado por Michael, Starter amigo da personagem principal do livro, Callie. Ao dar abrigo a ela e a seu irmão mais novo, Tyler, Michael começa a narrar seu passado, sua transformação em starter e suas relações com outros personagens da trama, inclusive suscitando um misterioso encontro com um ex-starter. Callie e Michael são Starters, classe social atribuída a jovens que estão "iniciando" a sua vida social e vivem numa sociedade Retrato de uma Starter é um conto introdutório ao universo Starter narrado por Michael, Starter amigo da personagem principal do livro, Callie. Ao dar abrigo a ela e a seu irmão mais novo, Tyler, Michael começa a narrar seu passado, sua transformação em starter e suas relações com outros personagens da trama, inclusive suscitando um misterioso encontro com um ex-starter. Callie e Michael são Starters, classe social atribuída a jovens que estão "iniciando" a sua vida social e vivem numa sociedade totalitária em que os Enders, classe de mais velhos da sociedade (espécie de Anciões) decidem quando você pode trabalhar. Até então, você deve ficar perambulando pelas ruas, atrás de água, alimento e abrigo ou contar com a sorte de arrumar uma namorada rica ou de ter algum parente distante para lhe salvar. Aparentemente é o que Callie fez quando sai para um encontro com um Starter rico misterioso que paga suas refeições e tem conversas sérias com a mesma. Mas quem é esse garoto e porque ele faz tudo pela Callie? Como ele conseguiu ficar rico? Como se desenvolverá o sentimento de Michael por Callie e seu irmãozinho? Portrait d'un Starter est une courte nouvelle écrite par Lissa Price en prélude au premier tome de sa saga dystopique Starters. La maison Robert Laffont l'a rendue disponible gratuitement au téléchargement sur un site entièrement dédié à la série, site auquel je vous recommande d'aller jeter un coup d'œil. Trop courte à mon goût, cette nouvelle propose une première incursion dans l'univers des romans. A lire donc de préférence avant de se lancer dans la saga. Michael est un Starter... Comprenez u Portrait d'un Starter est une courte nouvelle écrite par Lissa Price en prélude au premier tome de sa saga dystopique Starters. La maison Robert Laffont l'a rendue disponible gratuitement au téléchargement sur un site entièrement dédié à la série, site auquel je vous recommande d'aller jeter un coup d'œil. Trop courte à mon goût, cette nouvelle propose une première incursion dans l'univers des romans. A lire donc de préférence avant de se lancer dans la saga. Michael est un Starter... Comprenez un adolescent de moins de 20 ans, par opposition aux Enders, les adultes de plus de 60 ans, les personnes âgées, quoi ! Entre ces deux catégories, il n'y a personne dans la société que l'on découvre ici, les adultes d'âge moyen ayant absolument tous été tués durant la Guerre des Spores, sous les frappes de missiles bactériologiques. Il passe sa vie à fuir les forces de l'ordre, se réfugiant dans des squats en compagnie de son amie Callie, et du petit frère de cette dernière, Tyler. Portrait d'un starter nous le présente en train de dessiner un portrait de Callie, endormie à ses côtés pour échapper quelques heures à la bruyante toux de Tyler. A légers coups de fusain, Michael révèle une jeune fille au tempérament contrasté, plein de douceur et de détermination, en particulier quand il s'agit de protéger son frère. La situation semblant désespérée, on sent bien qu'il la soupçonne de lui cacher quelque chose, et il n'a pas tort, puisqu'il la surprend à pénétrer dans les bureaux de la société Prime Destinations, d'où les gens ressortent... changés ! Avevo iniziato questo piccolo prequel con il presupposto che fosse come qualsiasi libro "in più" di una saga, che di solito servono o a introdurla o a calmare gli animi esaltati delle lettrici che non stanno più nella pelle per i sequel,ma non sono particolarmente degni di nota. Deve essere detto che di questo genere di libri (come ho già detto "speciali") avevo letto solo Fallen in love di Lauren Kate che avevo trovato carino, ma niente di speciale e mi ero fatta un'idea in base a questo. Breve Avevo iniziato questo piccolo prequel con il presupposto che fosse come qualsiasi libro "in più" di una saga, che di solito servono o a introdurla o a calmare gli animi esaltati delle lettrici che non stanno più nella pelle per i sequel,ma non sono particolarmente degni di nota. Breve storia di uno Starter mi ha fatto ricredere.In meno di venti pagine viene raccontato in modo molto dettagliato un mondo che potrebbe essere quello del nostro futuro e mi ha fatta incuriosire moltissimo. Non mi soffermo sulla trama,perchè essendo molto breve finirei per raccontare l'intero libro. La scrittura è molto bella e per niente pesante, il mondo in cui è svolto molto particolare e porta il lettore a voler approfondire la sua conoscenza. Il libro è raccontato dal punto di vista di Michael, un'amico della protagonista del primo libro, Callie, che è un personaggio molto interessante e di cui terrò molto conto durante la lettura di Starters. Se avete letto Starters o state aspettando di leggerlo e non avete ancora avuto il piacere di dare un'occhiata a questo bellissimo ebook, che tra l'altro è gratis, fatelo, non ve ne pentirete. Los Angeles del futuro. Michael divide una squallida stanza con Callie ed il suo fratellino Tyler. Sono molto giovani ma sono costretti ad arrangiarsi per sopravvivere in un mondo che sta andando alla deriva. Un'epidemia ha decimato la popolazione risparmiando solamente i ragazzini, definiti Starters, e gli anziani, chiamati Enders. E mentre i primi vivono di stenti, i secondi si godono la vita fra agi, ricchezze e tecnologie all'avanguardia. Michael non ha altro che un album da disegno e un prof Los Angeles del futuro. Michael divide una squallida stanza con Callie ed il suo fratellino Tyler. Sono molto giovani ma sono costretti ad arrangiarsi per sopravvivere in un mondo che sta andando alla deriva. Un'epidemia ha decimato la popolazione risparmiando solamente i ragazzini, definiti Starters, e gli anziani, chiamati Enders. E mentre i primi vivono di stenti, i secondi si godono la vita fra agi, ricchezze e tecnologie all'avanguardia. Michael non ha altro che un album da disegno e un profondo istinto di protezione nei confronti di Callie. Per questo quando un giorno lei si allontana senza dare spiegazioni lui la segue, e si rende conto di una cosa molto strana: per le vie di Beverly Hills, uno dei quartieri più ricchi, incontra due ragazzi che è sicuro di conoscere, ragazzi che ha conosciuto per strada, che conducevano la sua stessa vita. Ma allora perché sono perfettamente puliti e nutriti e vestono con abiti così costosi? Perché quel ragazzo non ha più quella vistosa cicatrice sul viso? E perché quella ragazza continua a negare di averlo mai conosciuto? Ma soprattutto, perché Callie è entrata in quello strano edificio? Michael è costretto a scappare e ritornare dal piccolo Tyler, ma continua a domandarsi se Callie tornerà a casa quella notte. E soprattutto, sarà ancora la stessa?